The Noor Complex solar power plant, the world’s largest concentrated solar power plant, is currently being built in the Moroccan desert. The third phase, Noor III, is located near the town of Ouarzazate on the edge of the Sahara. It was switched on in February, 2016, and provides 150 MWe of the project’s planned 580 MW capacity. It is scheduled to be completed and delivered by the end of 2018, and will meet that date unless the final testing phase, which has just started, is unsuccessful. The project is expected to provide electricity for over 1 million people. It is owned by ACWA Power, a developer and operator of power generation and desalination plants throughout the Middle East and Africa regions. The third phase solar tower power plant, with its molten salt storage system accomplished first grid synchronisation in August. Synchronisation to the grid is the last step in construction before the plant starts commercial operation. It has been built by engineering and technology group SENER and is the second unit designed and built by SENER using its own central receiver tower and molten salt heat storage technology, following the success of the pioneering Gemasolar solar thermal plant that has been operating at full capacity in Seville, Spain, since 2011. It was the world’s first array of this kind to go into commercial operation, and technical innovations resulting from the project have been applied at Noor. At the end of September SENER started final tests at Ouarzazate III, marking the last phase before the plant’s commercial operation and final delivery to the client. This plant is one of the first projects in the world to apply the molten salt heat storage technology configuration on a commercial scale. 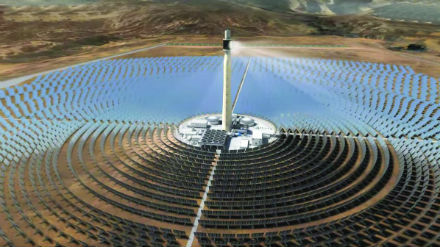 The high performance of this version of the technology – the molten salt is said to reach higher temperatures, 400 degC, than in other CSP technologies, which enhances thermodynamic efficiency – is claimed to be unique. CSP is more expensive to install than the widely used photovoltaic panels, but unlike them, enables the storage of energy for use during the night time and cloudy days, an important feature when compared with the variability of renewable sources in general. SENER has been responsible for the plant’s conceptual and basic engineering, supplying equipment for the thermal storage system, engineering and construction of the solar field and the molten salt receiver, and commissioning of the entire plant. During creation of the Noor complex it formed part of the turnkey building consortium for the phase I and phase II plants, both of which use SENER’s parabolic trough technology. Ouarzazate III consists of a solar field of 7400 HE54 heliostats (designed and patented by SENER), that deflect the sun’s radiation towards a receiver located on the top of the tower, at a height of 250 m, thanks to a highly accurate tracking system. The company has also been responsible for the receiver design and construction, in collaboration with Moroccan companies. Storage allows management of the solar energy in the absence of solar radiation and means that it can still respond to grid demands. The storage system at Noor Ouarzazate III allows the plant to keep producing electricity for 7.5 hours without solar radiation and guarantees the dispatchability of the power plant. SENER was also responsible for developing the integrated control system for the receiver and solar field, as well as the key mechanical components.